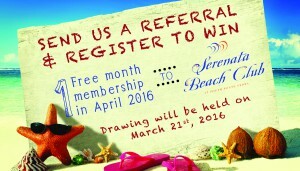 Referral entries are now being accepted and the winner will be drawn on March 21. The free membership will span the month of April 2016 and includes access to all Serenata amenities, including its 12,000 sq. ft. Mediterranean style clubhouse, several onsite pools, beach equipment, poolside cafes, spa services, newly renovated fitness center, family activities, events and member partnership perks like paddle boarding and ecotours. Know anyone looking to buy, sell, rent or rent out their home? Contact Davidson Realty today at (904) 940-5000 or visit www.DavidsonRealtyInc.com!